I know My Paradissi is not a food oriented blog (not yet, at least- paradise has to meet all the senses) but I had to post this one! As you all know, the internet is such a motivational machine, should it be used correctly, so, undoubtedly, I had an urge to head in the kitchen an make something sweet after seeing this and that. 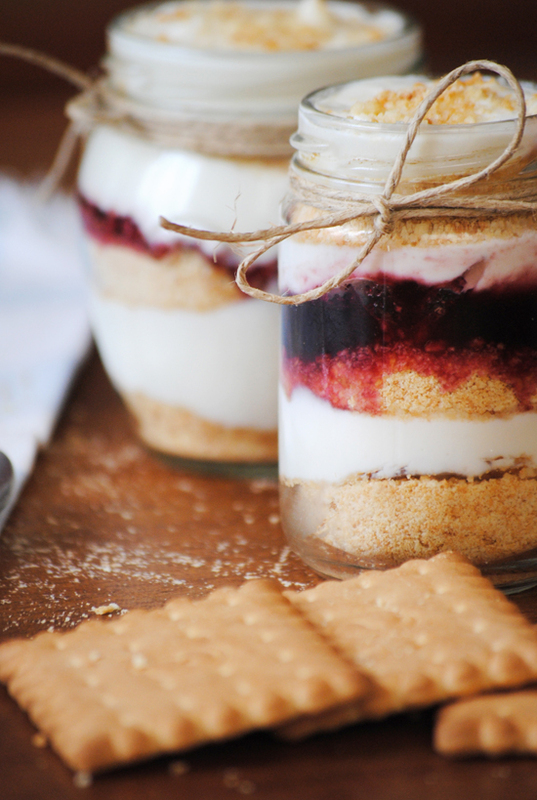 Homemade dessets in a jar seem like a hot trend at the moment; they are easy to make, easy to store and easy to serve! I improvised and tried out my favorite 10 minute sweet recipe in the jar version and voilà! Instead of mixing all the ingredients to one pudding, I just put them in layers. Here are the basic guidelines to make this yourself. 2. Crush the biscuits into fine crumbs. 3. Layer the biscuits, the cream and the marmalade inside the jar in turns. 4. Decorate with some biscuit trims. 9 comments on "Yoghurt & Cherry Paradise"
mm...greek youghurt! I'm going to try this! Just today I bought some greek yoghurt in the supermarket!! What a great idea and your pics are perfect!! Ok! You got me! This must be one of my favorite desserts! It would taste something like frozen yogurt. I will absolutely make this recipe! Great simple recipe! I will try it on holidays! yummi-yummi Eleni! and yummi pictures as well!